The Memorial Dr Garden Club Annual Couples party featured a fun roaring ’20s theme. Pictured are (from left) Martha Blecher, Glenn and Lisa Kline, Barbara Files, Diane and John Davis, Ken and Barbara Isham, Roz and Byron Cooley. 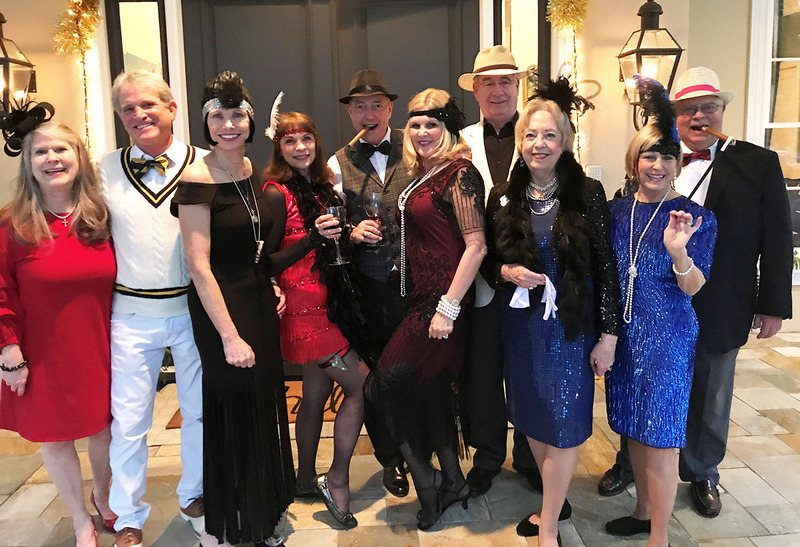 Ladies wore feathered hats and fringe while guys had pocket handkerchiefs or cigars to add to the Roaring ’20s theme at the Memorial Drive Garden Club Annual Couples party held at Jane and Jerry Clark’s home. To add to the fun, Barbara Files had a miniature (fake) gun in her garter, and Lisa Kline donned a black wig. At the Southern meal also were Glenn Kline, Ken and Barbara Isham, Roz and Byron Cooley, Martha and Keith Blecher, and Melanie and Bill Carter.